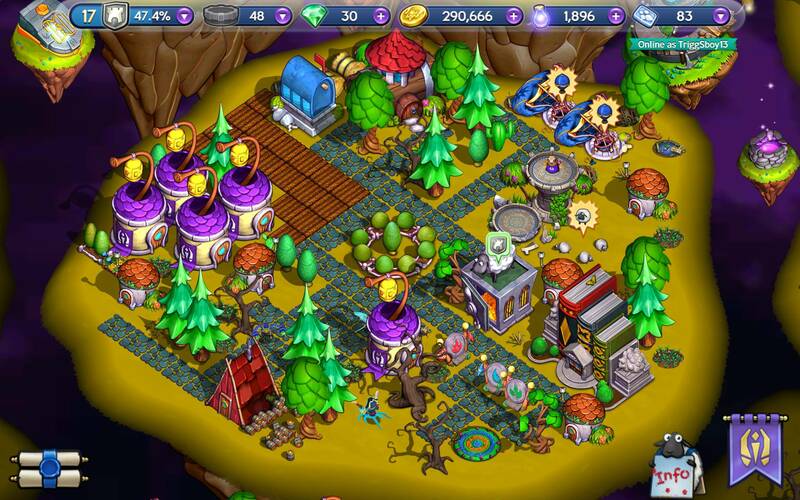 darkSpyro - Spyro and Skylanders Forum - Skylanders: Lost Islands - Post a picture of your central Island . 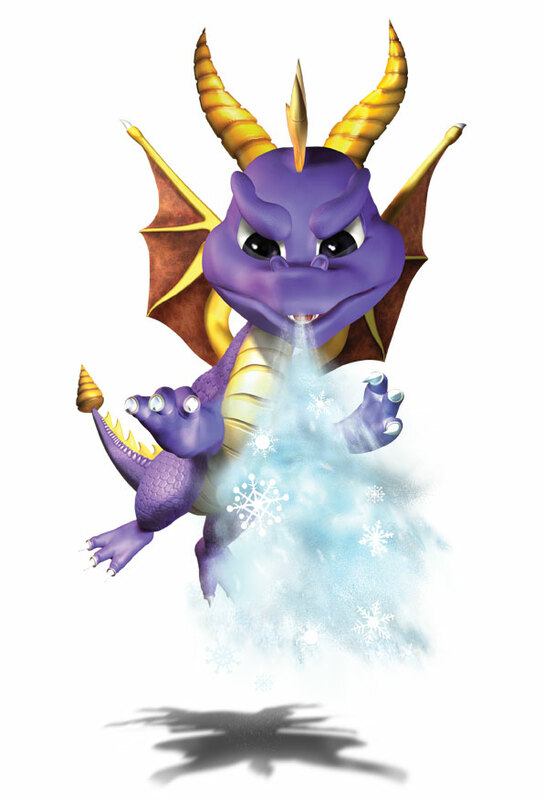 darkSpyro - Spyro and Skylanders Forum > Skylanders Mobile > Skylanders: Lost Islands > Post a picture of your central Island . I am so curious about my fellow users and would love to see all of your Kingdoms but i will settle for your central islands unless you have an elemental island which you are very proud of in which case paste that instead . Pretty Please and Thank you . I will go first . Thank you Midas . I was especially hoping to see yours . My central island is reserved for character houses and crops. I have a screenshot but can't figure out how to post it on this forum. Is there a trick I am missing? I am able to paste the photo into texts and emails but when I come here the paste button doesn't show up, just select and select all. Go to http://postimage.org . Upload it and hotlink it from there . Wow. No Sanctums, eh? I had already forgotten what the Life Sanctuary looked like. That might have been the coolest one. 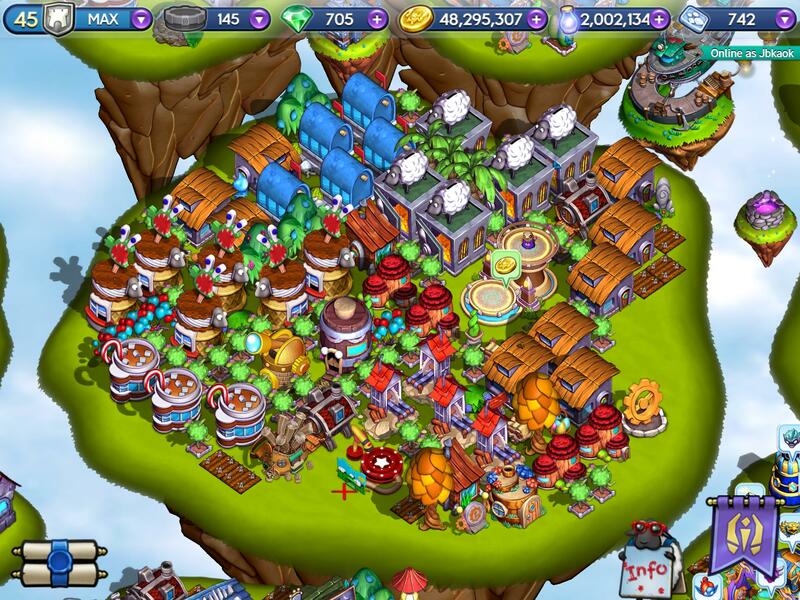 Here's mine, most of my operations are on other islands, this is just an XP farm. Welcome to the forum Erisian (at least, I assume you're new since you have no Gems next to your name)! If you don't mind some unsolicited advice, I would not put sheep topiaries around houses. Put them around your highest XP generating community buildings instead. They'll do more good there. None of the houses generate substantial kingdom XP. I hope you stick around and join the conversations! They're around the community buildings for the most part, but I'll shift things around again to ditch the houses. Thanks for the tip. I'm new, came to trade codes, staying for the fun. http://postimage.org and hotlink it to here . My center island is more of a downtown area with all the other islands being more functional. Now that looks like a real town . ! Very nice InitialFS, much more town-ish than any of mine. Trying to post mine at the behest of someone I cannot resist. Mine is very utilitarian. It's all of my shrines and all my alt and giant houses. 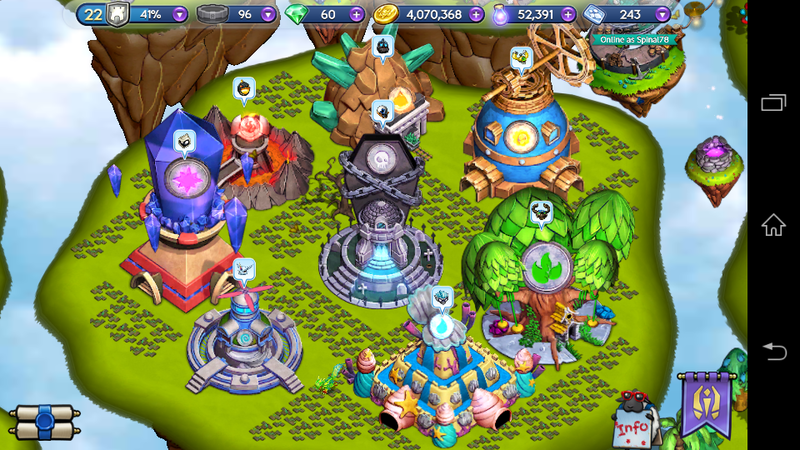 My halls of legend are right below on my Magic island. Trying to post ? I think you succeeded . Awww poor Orville got kicked off central Island again . . So I did! Yes, Orville got moved up to my earth island to be close to my adventure clock. He was actually further tucked away on air until he became important for the sanctum quests. He's generally a waste of space. He's generally a waste of space. How dare you blaspheme God king Orville the divine MOUTH OF EON ! Wow that is whole lot of airships . I only have two myself. Haha! I've acquired them over time and always on 50% off sales. I have enough to run pretty much all skylanders of an element at the same time in them, and will hopefully have enough to run the trap team skylanders should they ever be put into the gam. Mostly houses, low level community buildings and Orville. (still hoping for the sanctum quest) I need to get rid of some of those low-rent stone slabs to free up some space. I am maxed out on community buildings (sans gems ones) at the moment. Wow Jbkoak i am surprised you still have use for post offices at your level . I have every community building out just for completeness... I am slowly replacing housing with wood stack houses to make more room, and am kind of in a holding pattern until new buildings come out. I am still missing about 6 alt houses, and could use a few more dark/swap, but I'm saving up the gems for an expensive STT companion or two. I'm only level 13. My other islands are much better. This is my second island on a tablet .The difference between my civilized Level 39 kingdom and this Wild Untamed frontier is quite an experience . I am trying to play without toy linking . My biggest problem are the weeds. I am slowly getting rid of them and placing roads . If i dont do that , the entire island gets covered in a day or two . Qanai Very nice set up, if I every get that many of houses I will likely steal your set up for ease of use. Thanks. It grew out of my need to load up houses without doing to much thinking about selection - primarily finger memory. And then I have to adjust my finger memory every month. Here's an updated shot of my functional islands. Here is a full picture . Had to check it out on the Tablet so i took advantage . Ahh well bye bye wild lands . Oh thats easy just right click and copy image address from the host site. My centre island contains some of my historic buildings that I've kept around for completeness really. Not too fussed about maximising XP now but will probably be rearranged if space becomes an issue. Also thanks DF, the tutorial was a big help. 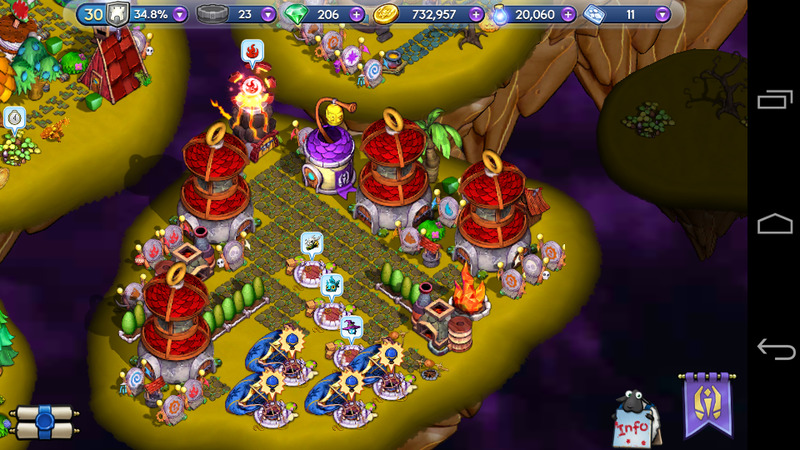 Here's my island, it's a bit goofy since I have had to start over, activision pushed me some gems. Also been haunting youtube off and on for a bit so my SL numbers look higher than my level warrants. It's a hodgepodge but it's home. Didn't know how to take screenshots on the phone until a while ago, but I do now. 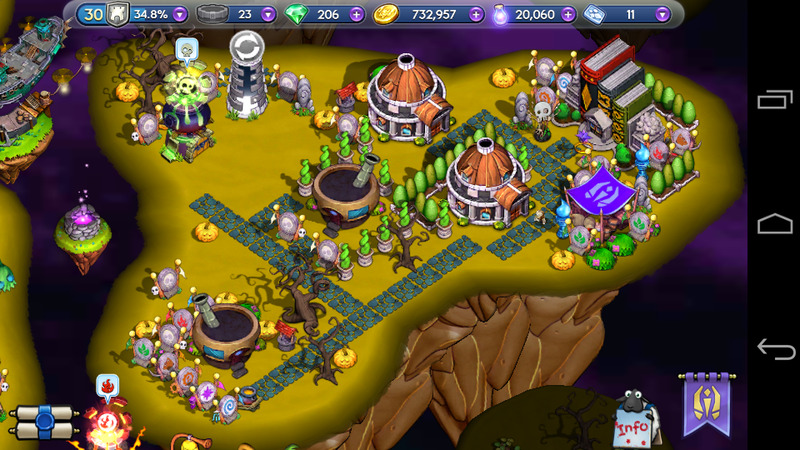 My Undead Island, my pride and joy and my objective in this game as a perfect otherworldly neighborhood. Currently renovating some things, but I plan to turn it into a general Undead production center if I manage to get HEH's house. The spooky trees are there to stay, I find them better than the Gem one,really. The others are too unfinished to show, but as honorable mentions, I made a field of farmland around the Life Sanctuary surrounded by bush lines,and have the rest of the Toy Link towers in a zigzag pattern in my mob farm. Thats a lovely neat island for your level Master BiFrost . There is always something else to do . Make small changes , there is no need to rush Master Midas. Sit down and imagine what you would like to do . Easier said than done! I need to get over my desire to "maximize" xp production first! 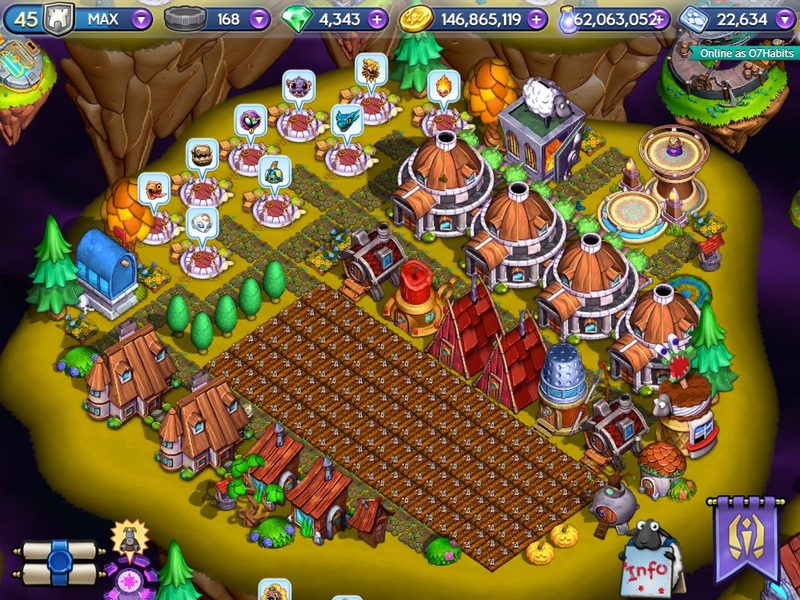 I have my Water and Tech islands for that while I still need levels for the mini islands. Since I'm fine with taking it slow,I just spare a few ones with grid patterns of decorations around the buildings that give the most XP.They're as ugly as they can be, but they do the job while I have to save up gems instead of prettifying the entire place. 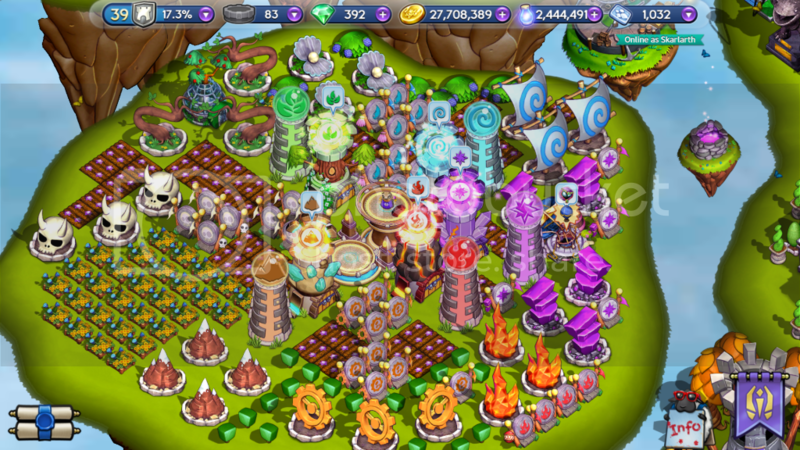 A picture of my central Island as of yet. Always keeping things organized as possible on my other islands.